The conference opens 4:00 pm Friday, June 16 and closes at 3:30 pm Sunday, June 18. Onsite registration begins at 4 pm on Friday, June 16. Cash, check and credit cards accepted. If you are a member of the Press, please Register Here. We will do our best to ensure that no one is turned away for lack of funds! If your organization would like to have a representative on the UNAC Coordinating Committee: please Click Here and fill in the email with the name of your organization and contact info. 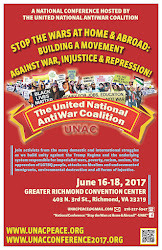 Write UNAC CC in the Subject Line of the email. How else do you think such a reasonably priced national conference happens? Participants pulling together!